I do is basically put the wig on this. Actually it has really nice hairline just in case you don’t want to do this method. Wow, it’s really natural. I used to wear half wigs a lot. Because it has better air permeability and is quite natural and does not appear bulky, especially in summer. Now let's see how to turn a full lace wig into a half wig. 1.Start at this point. Don't cut the clip. 2. Divide out the cut and weave it into a strand for us to cut. 3. Take the area you want to cut out and do it this way. 4. Cut out the one you want, according to your hair line. 5. 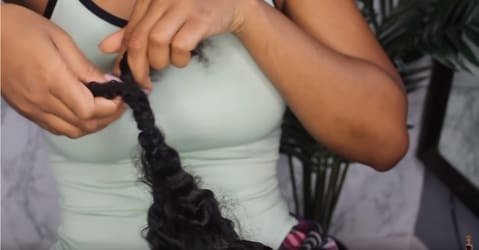 Sew the long clip onto the half wig to make it stronger. 6. When worn, mix our own hair with a wig to make the hairline more natural . Even if you wear the whole wig, it won't get hot, and the lace design is more natural and comfortable.